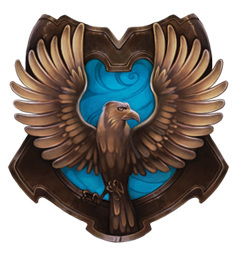 Entrance: Ravenclaw Tower, which is located on the west side of the castle; the entrance is a door at the top of a tightly winding spiral staircase that leads up from the fifth floor. The door has neither handle nor keyhole, but a talking bronze knocker in the shape of an eagle. Rather than asking for a conventional password, the knocker will ask a question; if answered correctly, the knocker will compliment the person on the answer and the door will swing open. Common Room: The common room, like the other House common rooms, is decorated in House colors (blue and bronze silk wall hangings, in this case, and a midnight-blue carpet decorated with stars). The room is wide, circular, and very airy, with a domed ceiling painted with stars, and walls with graceful arched windows that provide a spectacular view of the surrounding mountains. There are bookcases, tables, and chairs, and opposite the entrance is another door leading to the dormitories. Beside this door is a plinth on which stands a life-size statue in white marble of Rowena Ravenclaw wearing her diadem. Head of House Office: Seventh floor, the thirteenth window from the right of the West Tower. Entrance: The entrance is located behind a large painting of a Fat Lady in a pink silk dress. If you know the right password to tell her, she swings open to reveal a round opening in the wall. Common Room: The common room contains a lot of squashy armchairs, a fireplace, and tables. 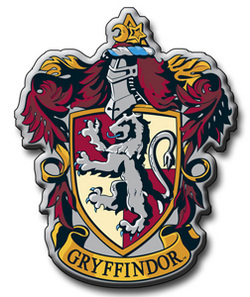 The fireplace is connected to the Floo Network, but as it is extremely public except in the dead of night, Gryffindors usually use owls to communicate with their families instead. There's also a notice board, for public announcements such as the date of the next Hogsmeade weekend, but also for notices from individual students seeking to buy or sell secondhand books, or trade Chocolate Frog cards, or similar, as in any school. 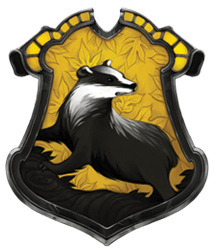 There are two staircases opening off the common room into the Tower itself: the boys' staircase, on which the seven boys' dormitories are located (one for each year) and the girls' staircase, on which the seven girls' dormitories are located (one for each year). The girls' staircase is under a spell so that if a boy sets foot on it and persists for a few steps, a wailing klaxon goes off and the staircase temporarily Transfigures itself into a stone slide, sending him and anyone else on the stairs sailing to the bottom. According to Hogwarts: A History, the founders believed that girls were more trustworthy than boys, so that while the girls' staircase is enchanted to prevent boys from getting in, the boys' staircase does not carry a reciprocal enchantment. Each dormitory is a round room with windows looking out onto the grounds, and containing four-poster beds. Entrance: Accessed through a still life painting found near the kitchens; to reach it, you enter a door to the right of the main staircase in the Entrance Hall and down a staircase there. Although it is therefore at dungeon level, it is "as dissimilar as possible" from the Potions classroom. Common Room: It is decorated in House colors which in this case means that there are lots of yellow hangings; like Gryffindor Tower, it has a lot of comfortable armchairs. There are "little underground tunnels leading to the dormitories, all of which have perfectly round doors, like barrel tops". Entrance: The entrance is in the dungeons in the form of a blank, damp stone wall. Once the correct password is given, the stone door concealed in the wall slides open and the common room becomes accessible. 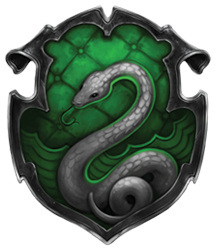 Common Room: The Slytherin common room is a low-ceilinged, dungeon-like room with greenish lamps and chairs, with skulls all around. It is located under the lake.